Lisa Waup looks back on her time in Darwin during her residency at Accomplice. I first met Weniki Hensch three years ago through a dear mutual friend. We shared several parallel lines of connection, one being that we were both adopted at birth. Since that day we have discussed together many topics of connection and planted the seed for working with each other on a possible project for the future – this manifested in Unpeeling Perceptions. The days and nights were jam-packed with discussion and many emotional discoveries. It was a very intense time and such a soul revealing topic, yet what unfolded that week was truly magical and a great test within myself, and Weniki also. We visited the Museum and Art Gallery of the Northern Territory to see the Papua New Guinea (PNG) and some of the Aboriginal collections. I am always taken aback when visiting collections within the depths of a museum – a still sound appears when we enter, yet not long into the visit the electricity of these incredible artefacts starts to inspire. This was a time for Weniki to connect with objects from her birth country – at times a rather overwhelming process. I also have great connections to the PNG side. My husband is from PNG and all our beautiful children were born there. I also have ancestral ties with the Torres Strait, so I was also very inspired and invigorated by seeing this collection. Our discussions manifested into visual pieces of connection – the more we learnt about each other, the greater the visual interconnections. A great deal of my adoption history lies within governmental paperwork, so I wanted to create a series of pieces that were made from my birth documents and recycled paper. The outcome was many paper vessels, weaving and stitching stories and history. These pieces became a work in progress, discovering and pushing boundaries within this medium. I also wanted to have an element of Darwin featured within these vessels, since I was a visitor to the Larrakia Nation – and my birth mother had once lived in Nightcliff and also my sister and her family too. I was fortunate to be introduced to historical metal artifacts from WWII from Nightcliff beach by Weniki’s daughter's father. The eroded metal pieces spoke beautifully to the delicate paper vessels, they almost had the same conversations of fragility and strength, a dialogue that continued throughout the whole exhibition. Unpeeling Perceptions opened at Mayfair Gallery. Its owner, David Collins, was a lifesaver, assisting us countless times, for which I am truly grateful. There were many trials and tribulations along this residency and I was very privileged to meet and connect deeply with many people along the journey, listening to their stories of adoption interconnection and also sharing mine. Lisa Waup was separated from her Gunditjmara and Torres Strait Islander family at a young age. 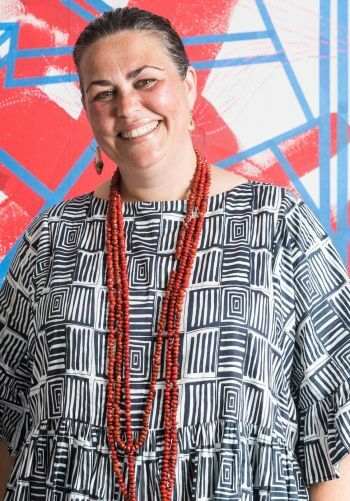 She received a Bachelor of Arts from RMIT University, and developed an affinity with Melanesian culture through her marriage to artist Naup Waup and experience of living in Papua New Guinea. In Darwin, Lisa was in residence with Wenike Hensch at ACCOMPLICE.